Rahul Purandare is an Assistant Professor in the department of Computer Science and Engineering at the Indraprastha Institute of Information Technology Delhi (IIITD). He received his Ph.D. in Computer Science from the University of Nebraska - Lincoln. Before starting his Ph.D., he worked in software industry for 10 years in various capacities such as a software engineer, a project leader, and a senior consultant. His research primarily focuses on program analysis and he has published his work in the proceedings of several reputed conferences including OOPSLA, ICSE, FSE, WSDM, ISSTA, ASE, FM, MSR, IROS, Mobiquitous, PEPM and RV. 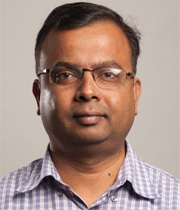 He has received the ACM distinguished research paper award for the work which was presented at ISSTA 2013. Program Analysis, Program Verification, Software Testing, Automatic Program Repair, Program Optimization, Program Comprehension, and Code Search. Program Analysis, Data Structures and Algorithms, Compiler Construction, Theory of Computation, Software Engineering.